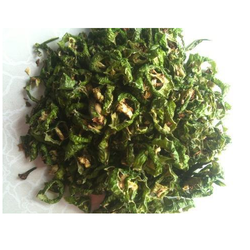 Leading Manufacturer of dehydrated green capsicum and dried capsicum from Indore. 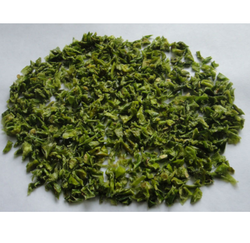 Garlico Industries is a preferred choice in the field for offering Dehydrated Green Capsicum . Dehydrated at certain temperature, this green capsicum is a good source of anti-oxidants. Owing to the optimum anti-bacterial, anti-fungal and anti-aging properties, the proffered green capsicum is vastly demanded among our patrons. Dehydrated green capsicum is provided in safe packaging. Our company involves in offering Dehydrated Green Capsicum that is vastly acclaimed for its anti-aging, anti-bacterial and anti-fungal properties. Free from contaminants, the offered green capsicum is dehydrated at a particular temperature, for a certain time. Rich in vitamin B complex, thiamine, molybdenum, potassium, manganese, tryptophan, copper, cobalt and zinc, the offered dehydrated capsicum is vastly asked for. Our customers give us various specifications as per their requirement and we meet them efficiently while processing our product and packaging them. Our Dried Capsicum is commonly used in soups, vegetables, and many more food preparations. Not only they are rich in essential nutrients but our hygienic procedures and packing give them a long life. Our prices are one of the best offered in the market.